Happy Birthday to me! Oh, wait… it’s not my birthday. But on Wednesday, it sure felt like it was. I had the pleasure of reviewing one of ProFlowers Birthday Baskets. ProFlowers boasts “a fresh connection” – all their flowers are delivered freshly picked from their farms in California and sent directly to you. Not only does ProFlowers specialize in fresh flowers, but also in birthday gift baskets. From relaxing spa baskets to fruit baskets and meats, cheeses and cracker baskets… you’ll be sure to find just the right one for that special person in your life. 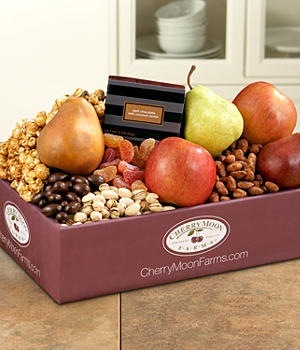 From sweet pears to melt-in-your-mouth dark chocolates, this collection boasts a four-star variety of opulent treats. Whether your recipient is family, a colleague or that special someone, these delicacies will always keep them coming back for more. Technically, One Sweet Mix isn’t a basket, but I have tons of baskets so I really didn’t need another one. And instead of chocolate covered cashews, mine had chocolate covered almonds. Again, this worked out great because I prefer almonds over cashews anyway. Also, instead of the Dark Chocolates with Coconut Center I got Chocolate Covered Bridge Mix, which was okay, but I would have preferred the coconut centered dark chocolates. The pears weren’t ripe – this makes sense because you wouldn’t want to have over-ripe fruit delivered to you. But tonight I was able to try out the Burre Bosc Pear and it was juicy and delicious. Since my other two pears aren’t quite ripe enough yet, I can’t say how the taste. I can say that they’re no bruising or discolorations. The Fuji Apples were huge, crispy and very tasty. My son was disappointed there wasn’t more. My favorite thing from One Sweet Mix was the Cinnamon Almonds. And let me tell you… you can’t eat just one. 🙂 My husband was quite fond of the Pistachios. All in all, I was very pleased with the One Sweet Mix. I highly recommend ProFlowers Birthday Gift Baskets. And they’d make great gifts for many other occasions, like get well soon baskets, Mother’s Day and more.